The use of chemical weapons during the Abyssinian war was internationally known at the time. The Emperor Hailè Salassiè in person spoke about it at a League of Nations session, and the issue was raised several times also by foreign military observers, advisers and the medical staffs attached to ambulance units and the Ethiopian Red Cross. However, the matter failed to spark extensive protests or condemnations for two reasons. War as child's play. 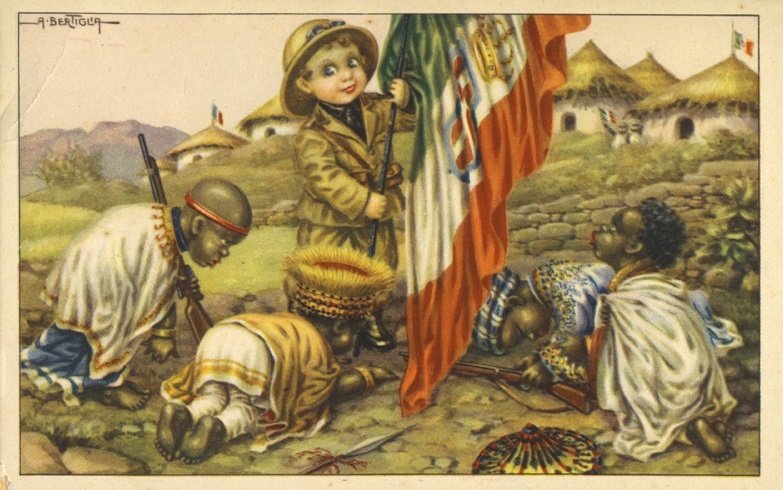 One of a series published in Italy during the Ethiopian War. 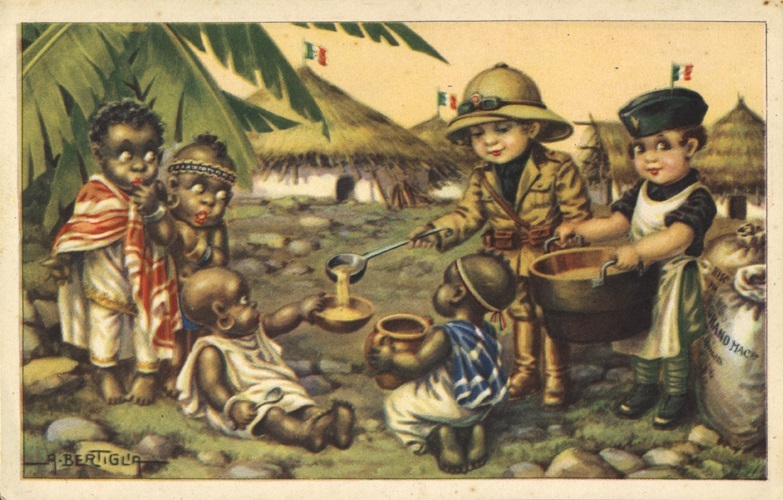 First of all, the international community was much more concerned with the political issues related to the serious League of Nations’ crisis opened by the Italian invasion of Abyssinia than it was with purely military aspects of the matter. And at the time the use of chemical weapons was perceived almost exclusively in its military context. Furthermore, other powers had recently used chemical weapons in extra-European contexts: the British during the 1920 Iraqi revolt (actually there were only allegations, and such use was possibly limited to tear gas) and the Spanish (with the full knowledge of France) during the 1921-1927 Rif War. Apart from such aspects, mostly related to the “high politics” dimension of international affairs, the issue was rapidly forgotten in Italy. Even after the Fascist regime’s downfall, for two decades there was virtually no debate on it. Quite uncommonly in memoires, veterans’ books, etc. there were mentions of chemical weapons, mostly in reference to the very few occasions on which Italian soldiers physically encountered chemically-contaminated areas. However, during the Sixties some left-wing Italian scholars began to publish historical accounts about the matter, greatly over-exaggerating the chemical weapons’ impact both on the war’s outcome and on the Abyssinian armies/population. Some of them based their conclusions almost exclusively on interviews conducted during the Sixties and Seventies with the Negus, Rasses and Ethiopian former combatants. Others involuntarily inflated the real amount of chemical agents delivered because they were not able to distinguish the concept of delivery total weight from the payload weight. Nowadays, finally, other scholars have focused their historical assessments on a supposed widespread attitude of self-censorship and removal of the matter from national memory. The latter perspective is quite puzzling, since, for example, Marshal Rodolfo Graziani’s book Fronte Sud, published immediately after the Abyssinian campaign with a preface by Mussolini, proudly defended the role of chemical bombings in the operations, although mainly as a mean of psychological warfare. Also books of popular history published in the Seventies (like those of Franco Bandini, who always maintained a sympathetic approach to the Italian colonial adventure) had no hesitation in dealing with the matter, and also in some documented details. Right-wings historians and journalists (some of them veterans of the Ethiopian war), on their side, answered the left-wing scholars in a number of ways. Few continued to write books about the conflict, simply avoiding any reference to chemical aspects of the operations. Others chose to disregard all the presented evidence and pretend they were unaware (and they were aware! ), for example, of the above-mentioned Graziani book or Badoglio admissions (we’ll talk about them below). Debate also raged regarding Mussolini’s involvement in the decision to use gas, as the Duce found many defenders among the right-wing scholars. A few, quite ridiculously, claimed that the decision to resort to chemical weapons was to be ascribed only to the military establishment and/or colonial officials; according to them, Mussolini was so fine in understanding international politics and public opinion that certainly he would have avoided such a political “own goal”. Others were prone to admit Mussolini’s responsibilities in the decision-making process, but were convinced that, due to his ignorance in military matters, he was dragged into authorizing chemical warfare by the fears of his commanders (Badoglio and Graziani) that they could not handle the fierce Ethiopian counterattacks. Actually, several documents clearly show how Mussolini supervised all the main aspects of the resort to chemical bombings, and that he was eager to proceed with them owing to the urgency of winning the war and ending the international political crisis opened by it. 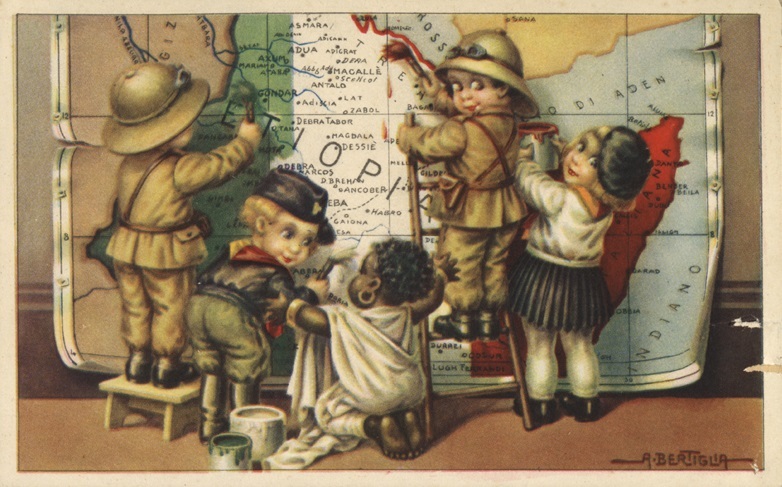 Italy's civilizing mission: not an attitude likely to foment opposition to chemical warfare. All the above perspectives, driven by political reasons, meta-historiographic narrations and, sometimes, also by incompetence regarding the technical aspects, have grossly tainted a correct assessment of the whole issue, which still forms a “hot topic” in the Italian national debate. Ideologies are the worst enemies of historiography. Even nowadays (when documents and records are totally accessible, or, at least, one can engage with various readily-available sources thanks to the internet) the above-mentioned right-wing and left-wing fallacies still have their followers. Especially the latter appears as having “won the hearts and minds” of a certain layer of Italian (and also foreign) public opinion believing that chemical warfare played a central (and “foul”, if not sadistic) role in the Ethiopian defeat. Such perspective has imprinted a lot of prejudices posturing in a clearly “national self-deprecating style.” In recent years, however, more accurate studies based on archival documents have been carried out. Unfortunately, their diffusion is almost restricted to the “sub-cultural ring” of military historians (the real ones, not those academics who pose as such, and, unfortunately, are also recognized in this manner). At any rate, the table below proves that chemical bombings, from an operational point of view, were mainly employed according to area-denial concepts; that’s clearly conveyed by looking at the “target” column. The table shows that the periods of major resorts to chemical bombings were mostly related to dates when Ethiopian counterattacks were threatening the Italian advance, or when the disrupted but still large armies of Ras Mulughietà and Ras Cassa were in retreat. The resort to yprite bombings dramatically declined just before the Battle of Mai Ceu against the regular Kebur Zabagnà army under the command of the Negus: simply, the Italian and Ethiopian armies’ main echelons had come too close to each other for the employment of chemical weapons without posing some risks to friendly forces. After the Ethiopian defeat in that last great battle of the war, there was little need to go on with chemical bombings, and only in the Southern Front they lasted an additional month. By starting from technical considerations, the chemical agents mainly used were: phosgene for choking effects; yprite as a blister agent (actually it is not a gas but a liquid, and different subtypes of this sulfur mustard agent were used); and arsine (usually called this in most of the documents, but actually it was diphenylchloroarsine) for irritant effects. The first two types were employed through aerial bombings, while the latter was delivered only by artillery. At any rate, readers with some chemical warfare knowledge will immediately recognize the need for all such kinds of agents to be delivered in a very concentrated manner over massed troops in order to achieve lethal effects. Arsine, in particular, was expected to pose as the most problematic to achieve such effects, and in the operational planning documents arsine devices were reported as actually lethal only in very high concentrations, which were almost impossible to achieve under the typical battlefield conditions of the Abyssinian campaign. Their main effects on the victims were limited to sneezing and vomiting. The difficulties of conducting effective chemical warfare in the imminent Abyssinian campaign had already clearly stated in the aforementioned February 11th 1935 letter by the Chemical Military Branch to the Ministry of War. The experts foresaw that in the very hot Ethiopian theater, dispersed agents would require additional density than under normal conditions, due to the high presence of thermal columns. Low expectations in terms of efficacy had also been noted for plateaus, since their low temperatures and exposure to high winds would affect the correct dispersion of some of the employed chemical agents, especially yprite and phosgene. Such a cute little war criminal. A large share of the historiographical literature (that available in English, for its most) mentions also dusters or aerial tanks for spraying chemical agents, probably giving credence to the Negus’ statements included in his appeal to the League of Nations. Actually such devices were not in service (after experiments during the Libyan insurgency, aerial dusters for chemical agents were considered almost more dangerous for crews than targets on the ground, and ruled out as a possible means of delivery during the planning stages prior to the Ethiopian campaign) and, possibly, this erroneous belief was generated by the use of bombs which burst a few hundred meters above the ground. The most commonly employed aerial bombs were indeed the so-called 280 kg C.500.T. Their 212 kg yprite payload opened at 250 meters above the ground for dispersal over an elliptical area about 500 to 800 meters long and about 100 to 200 meters wide, oriented toward the wind direction. The bomb showed a certain degree of unreliability, and several of them were reported directly hitting the ground, with negligible payload dispersion. Other air-launched devices were 21 kg (13 kg of payload, released only after direct impact on the ground) yprite bombs and 31 kg and 41 kg phosgene bombs (unknown payload). All three were used only on the Somali front (see the table below), and reported as obsolete, unreliable, and also old enough to pose some risks in their handling. No land-based systems, like cylinder tanks filled with gas which would be pulled by the wind toward the enemy, were used, due to the high risks posed by such devices without careful and prolonged training (during the Great War similar methods usually also caused casualties among friendly troops, due to the erratic behavior of the wind). Actually, the training for any kind of chemical weapons and their means of delivery was generally poor, and the commanders and their personnel were quite fearful when handling them. At the time the agents were not binary, and most of them had to be properly prepared and/or placed in the means of delivery just before their use. This may explain why in the table below a lot of bombings actually employed very few devices, certainly achieving scarce effects due to the difficulties in gathering the necessary density for an effective release of the payload. Possibly, commanders preferred to minimize handling risks by arming few bombers (and bombs) for most of the air raids. Since a lot of combat missions were actually fruitless thanks to the elusive nature of the enemy, the handling risks were in this way minimized by taking into account the results that were reasonably thought as possible to achieve.